After the surprise result in Brexit polls, when the market began its rapid descent, we had expressed our viewpoint in the article "The Stock Market Is Not Ready To Give Up," making a case for continued upside in stocks through the summer. 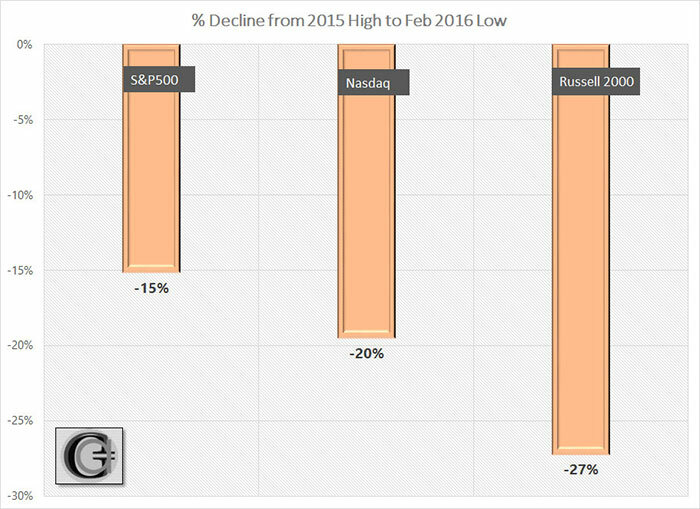 In this article, we would like to highlight the performance of the small-cap market and its leading role since the market began recovering after reaching a 52-week low in February this year. During 2015, small caps, as represented by the Russell 2000 Index and its tracking ETF (IWM), declined -6%, compared to the broader market represented by indexes Nasdaq Composite (QQQ) and S&P 500 (SPY), rising +6% and +1% respectively. The divergence between small caps and larger caps was due to risk-averseness, driven by the possibility of an interest rate policy shift by the Federal Reserve for the first time in 6 years. 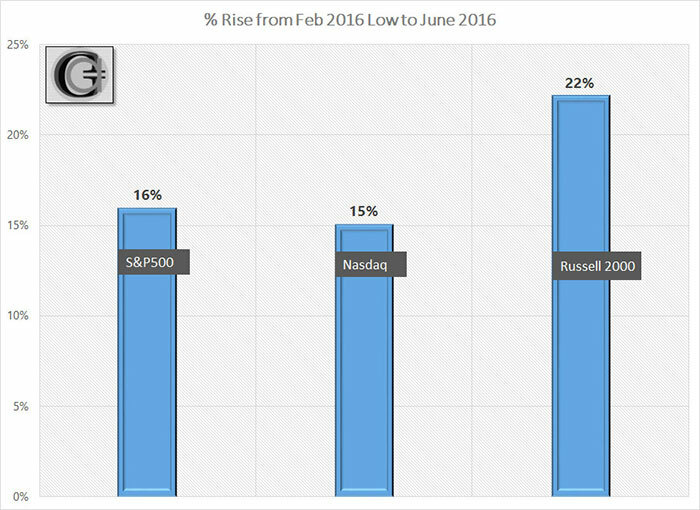 But the overall 2015 performance masked the steep correction for small caps that began in July 2015 and continued till February 2016. "With additional volatility comes a shrinkage of risk appetite, which disproportionately affects relatively higher-risk segments of the market like small caps…"
This alignment allowed the Graycell Smallcap Portfolio to be up +15% last year versus a decline of -6% experienced by the Russell 2000. However, 2016 has presented a contrasting picture to 2015. 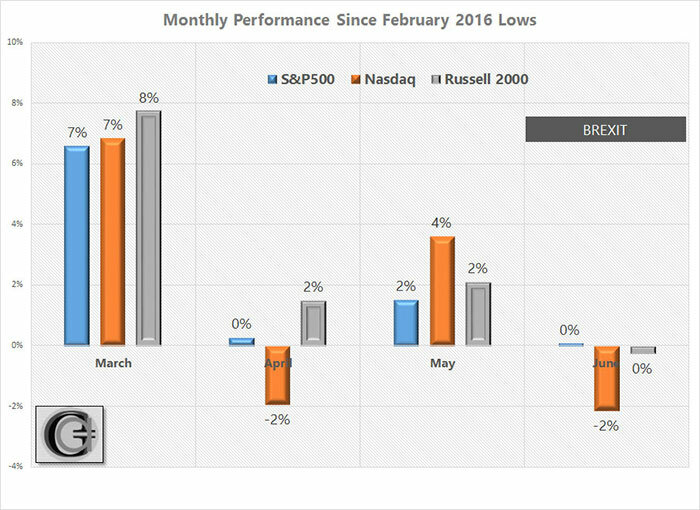 The small-cap index has kept pace with the broader market each month, since February's low. 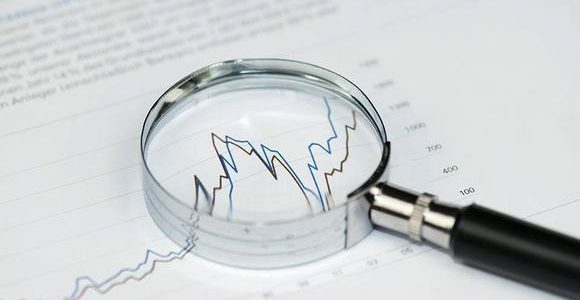 The participation of the small-cap index is a positive indicator for the health of the market, suggesting a growing risk-appetite, which is a prerequisite for rising stock prices. The Russell 2000 index has a broad representation comprising 10 sectors, but 5 sectors account for 84% of its market value. The largest sector is Financials at 25%, followed by Technology at 17%, while Healthcare, Industrials and Consumer Discretionary account for ~14% each. 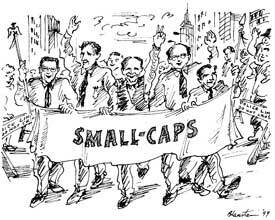 The small-cap rally has been fairly broad-based with strong peformances from companies across industries, like Mining & Metal companies First Majestic Silver (AG), Alamos Gold (AGI), Coeur Mining (CDE), McEwen (MUX), Cliffs Natural (CLF) and Ryerson (RYI); Technology companies like Quad Graphics (QUAD), Meet Me (MEET); Brightcove (BCOV), Energy and Chemical companies like Stone Energy (SGY), Emerge Energy (EMES), Fairmount (FMSA), and a few Biotechnology companies like Exelis (EXEL), Minerva Neurosciences, and Exact Sciences (EXAS). The small-cap recovery from the lows has in fact been sharper than the broader indexes. What has been another notable feature about the small-cap recovery is that it has occurred at a time when there has been no meaningful contribution from the Biotech sector, which remains gripped in a sector bear market, as was further pointed out in the Biotechnology - The Perfect Yo-Yo article. But that may change as well. We continue to believe that the small-cap rally has further room to run over the Summer, and potentially target new 52-week highs. The second quarter earnings season is about to unfold. Even though S&P 500 earnings have been declining for many quarters, in what is often termed as an "earnings recession," the second-half may start to look promising on the back of rising consumer confidence and spending, and an improving economy, compared to the first-half. In addition, small-cap companies are more sensitive to domestic economy performance and consequently do relatively better on signs of an improving economy. All this is against a backdrop of more dovish central banks for all major economies, as discussed in our previous article. After being in cash during the first quarter, the Graycell Smallcap Portfolio benefited in the second quarter from its small-cap exposure to companies like Celator Pharmaceuticals (CPXX), Coeuer Mining, First Majestic, Fairmount Santrol, Once Therapeutics (ONCE), United States Steel (X), and a few other leading performers. The year-to-date performance, as of June end, was +49% for the Graycell Smallcap Portfolio, +1% for the Russell 2000, +3% for S&P500, and -3% for Nasdaq. At this point, small caps are well-positioned to gain further on the backs of a steadier economy, and dovish Fed policy. Consequently, an exposure to this segment is prudent and important for stronger blended portfolio returns.